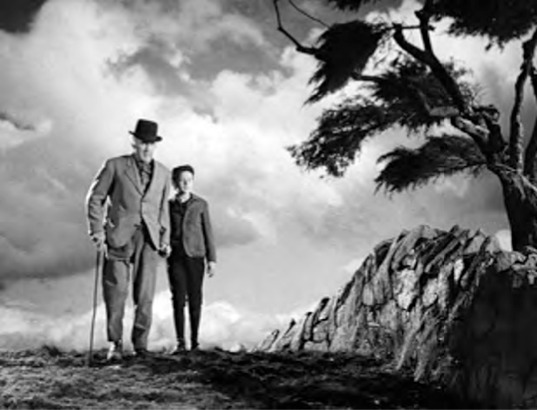 "How Green Was My Valley" is a John Ford masterpiece. It premiered in 1941 and became a successful and popular film. It beat out "Citizen Kane" for Best Picture. It boasts of a great cast with Walter Pidgeon, Maureen O'Hara, Donald Crisp, and Roddy McDowall in his first major feature film. Now when I think about this movie, one word stands in the forefront of my mind: Memory. The life that is found within a memory. The film begins in a dying town. A town that was stripped of its life by the coal mine. A faceless man is packing his belongings in preparation to leave this barren land. As he is packing, he shares that he can close his eyes and see the town as it used to be. A town full of life, song, and green. He can clearly see the faces of his mother and sister as they prepare the evening meal. He can see the faces of his brothers and the townsmen as they leave the mines to walk home with a song on their lips. He can see the face of his father as they take their custom walk through the fields and around town. I imagine he could still feel his father's hand as he holds it during their walk. As the faceless man, Huw, walks down memory lane, the audience gets to see the town and people change over the years. We see people getting married and leaving town. We see people forced to leave town to find better work. We see the mine killing people. We see the hypocrisy and lack of compassion of Man. We see Huw growing up and becoming a man. I'm fan of John Ford's movies. Curiously I've only seen "How Green Was My Valley" once and not from the beginning. What I remember of the movie you mentioned in the post: the family, the little boy, the village. I remember vividly the scene when the workers are trapped in the mine. The beauty of Maureen O'Hara and her passion for the local priest. The cinematography is fantastic, it manages to turn Wales into an enchanting place. It's a nostalgic movie about a past that doesn't return, much like our childhood. Your text captures this feeling. It's one movie that I need to re-watch again and many times. Yes exactly right. A past that doesn't return. I agree beautiful cinematography. Great direction and acting. I hope you get to see it from beginning to end. Thanks so much for reviewing.